What should be displayed upon an approved helmet? What should be displayed upon an approved helmet? A. 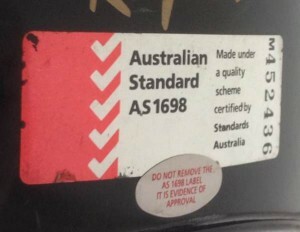 An Australian Standards AS1698 sticker. B. Bright stickers to make the helmet more visible to vehicle drivers. C. A manufacturer's approval and checked by sticker. Your helmet is designed to minimise the risk of head injury and therefore they are made to specific standards to ensure that each helmet meets the minimum criteria. 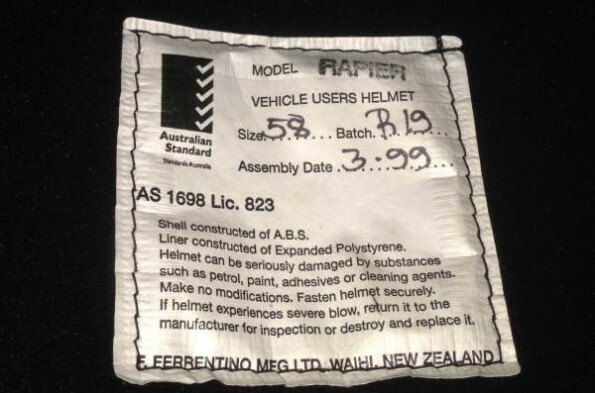 In Australia there are standards for motorcycle helmets based on Australian Standard 1698-1988 Protective Helmets for Vehicle Users (AS/1698). All motorcycle helmets feature a hard outer shell capable of resisting penetration, a system for holding the helmet onto the head (usually a chin strap), and a soft, padded interior to absorb impact energy. Helmets might also have a visor, ventilation holes, a face shield, communications systems (e.g. built-in earphones and microphone) and/or aerodynamic attachments to prevent aerodynamic lift at speed. The helmet must have a required amount of peripheral vision, i.e. it can’t unduly restrict the rider’s vision as this would be dangerous when riding in traffic. It’s important to read the guidelines that are in the helmet or its accompanying brochure or manual as these will explain that no helmet will give 100% protection against all possible impacts, but for maximum protection it must fit firmly on the head with the retention system fastened securely and tightly so that it stays on the head when the helmet is pulled upwards or from behind. If the helmet is designed to be used with goggles, it will be stated; otherwise, don’t use your helmet with goggles. The helmet may be designed to be used with other attachments such as specific visors. Only use attachments produced by or recommended by the manufacturer. Don’t drill into the helmet or cut it in any way. If the helmet is dropped or receives another kind of impact such as in an accident, it may suffer damage that is not visible, therefore it should be replaced. A list of materials that are OK to use for cleaning the helmet will be supplied. Some helmets can be damaged by long-term sun exposure. Over time the helmet liner may become worn out or compacted so it’s advisable to replace helmets periodically if you are wearing them frequently. Also, be aware that newer helmets are likely to have better technology and crash resistance than older helmets. It’s advisable to replace any helmet that was bought before the standards became law on 19 December 1990. You can read the Consumer Protection Notice No. 9 of 1990 here. Just as there are penalties for not wearing a helmet, there are penalties to manufacturers, importers, distributor, retailers and hirers for supplying helmets that don’t adhere to the standards. The maximum fine is $220,000 for an individual or $1.1 million for a body corporate for failure to comply with a mandatory safety standard. Civil penalties for the same amounts also apply. A supplier must notify the Commonwealth minister within 48 hours of becoming aware that a person suffered serious injury, illness or death associated with a consumer good or product-related service they supplied. If not, the maximum fine is $3330 for an individual or $16650 for a body corporate. More information on fines is available here. Helmets that adhere to the standard will have been tested by an approved specialist laboratory. You will need an approve helmet if you are going to get a motorbike, and you will also need to get a motorbike licence. You can practice DKT questions for your theory test here.